Seamlessly integrating into the production workflow of any TV station or post-production facility, just:in records multiple video sources directly into Apple QuickTime, MXF OP1a and MP4 containers. Unlike other software design philosophies just:in unites single and multi-channel ingest into one flexible and expandable client-server ingest solution. just:in is built for 24/7 deployment and easily adapts to the shifting requirements of time sensitive broadcast environments. Featuring fallback destinations for out-of-storage or network connection loss scenarios and safe-write logic in the event of a power outage, just:in ensures that your recordings are safe and secure. Customizable presets allow operators to quickly switch between commonly used setups. The ability to use two or more concurrent capture instances also makes just:in the ideal ingest solution for loop recording. This significantly speeds up editing in your NLE, without prior conversion in MAM systems. Using the integrated XML writer engine operators can either customize XML export by writing XML files with descriptive metadata to accompany QuickTime and MXF generated files or by writing the desired metadata set directly into the QuickTime file (Metadata can be easily imported to Cantemo Portal or Axle). Customizable pre- and/or post-record scripts allow operators to automatically execute actions like generating placeholders in MAM systems or uploading files to FTP servers. just:in is a client-server solution. 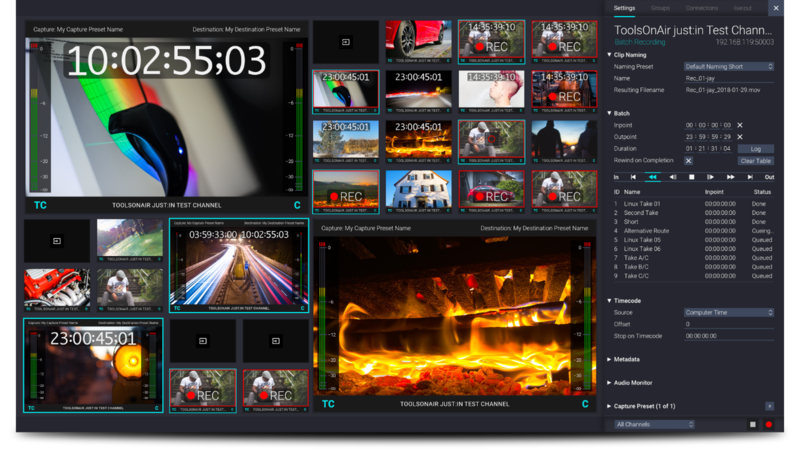 With the built-in video and audio previews and the single/multi-channel control panel, the ingest operator controls all available ingest machines from a single interface.